My grandmother (Grace Josephine Bidwell) Wilcox was one of the seminal figures of my youth. She was a wonderful story-teller, and she would enthrall me with tales of Stockbridge history, as well as stories of her younger days. Some of those stories involved her grandfather, Edwin Curtis Bidwell. I sensed that she had the same kind of relationship with him as I did with her. One of the stories she told me about her grandfather involved a carriage accident he had in Vineland, New Jersey, where she grew up. In the accident, one of his legs was badly injured, after which he was able to get around only with the aid of a cane or a wheelchair. He was sixty years old at the time, too soon to retire from his pharmacy business, yet his mobility impairment prevented him from getting around as much as had been his wont. To help keep his mind active, he took up the hobby of collecting genealogical information on his family. He had plenty of family to keep track of, since he came from a long line of Bidwells, and had ten children of his own. Only a few of those children lived into adulthood, but he still had many grandchildren. My grandmother told me she was quite surprised when he told her he was giving all of his records to her. She had not shown much interest in his genealogical pursuit, and she thought herself an unlikely candidate to receive all his work. She never admitted it to me, but I suspect that might have been the thing that triggered her interest in history. She went on to become a librarian, and, while employed at the Stockbridge Library, started a collection of objects, clippings, and correspondence which became the Historical Room; an important feature of the Library, the care of which eventually became her full-time job. Unlike my grandmother, I was not surprised when she told me she was leaving the family records to me. I had certainly taken a shine to her stories and had frequently perused the family books and correspondence she kept, in several shoe boxes, on the top shelf of one of the steel cabinets in her office. 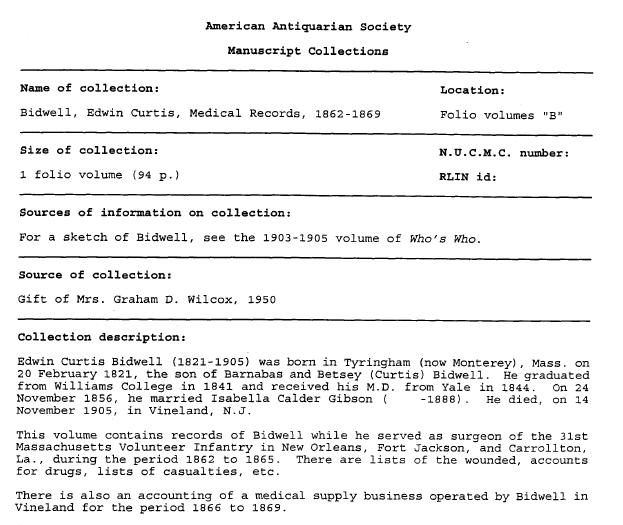 I have recently discovered that she had other records that she donated to the American Antiquarian Society prior to the time I began to hang around with her. I do have to confess, though, that the mantle of family historian has been taken up by my brother Rick, who remained involved with Stockbridge affairs (including many years as Chief of Police), while I went off to seek my fame and fortune elsewhere. 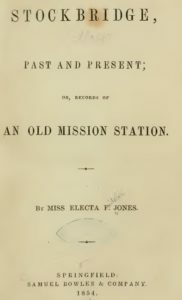 I have given him copies of all the relevant documents I possess, and also shared those with the Stockbridge Library and The Bidwell House Museum in Monterey. I’ve never been to Vineland, a deficiency I hope to correct soon. 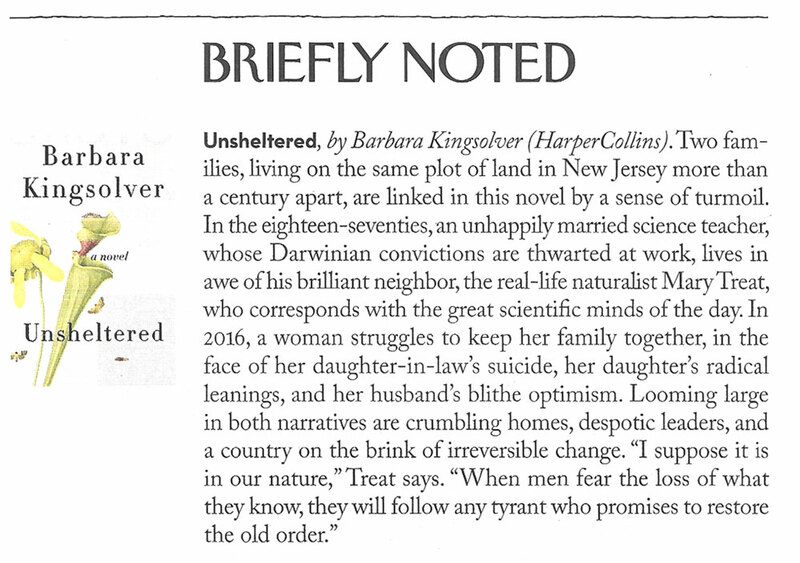 My interest in that place was recently piqued when I discovered that Barbara Kingsolver’s latest novel is centered on a house in Vineland. It’s a clever interweaving of two stories; one that took place in very recent history (nearly three years ago), and the other in the same locale in the early 1870s, when Vineland was still a new Utopian experiment. Edwin Curtis Bidwell moved there in 1866. 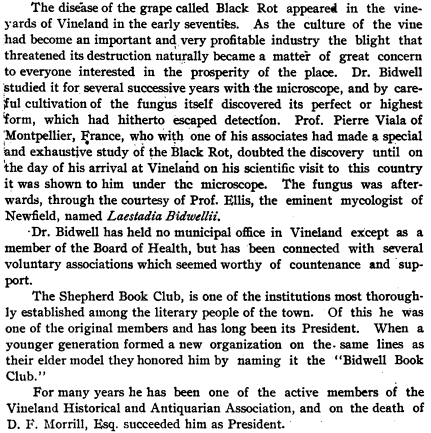 This is a snippet from a book I found (The Early Physicians of Vineland NJ) while looking for historical accounts of early Vineland. 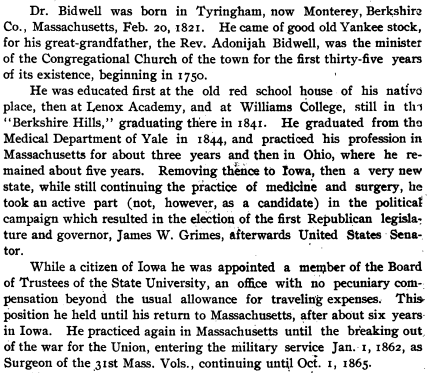 Note that this account of E. C. Bidwell (ECB) was written by his son (and my great-grandfather), Edwin Hugh Bidwell. The accident referred to in this first paragraph is undoubtedly the one I had heard about from my grandmother. This short account contradicts (or at least glosses over) some other information I have from family documents. I will have to dig them out for later display and confirmation, but my impression is that he chose to leave the medical profession after his service in the Civil War because he was traumatized by what he had witnessed. Vineland was established, in part at least, to promote the abstinence movement, to attract Freethinkers, and to be an agricultural showcase. The name itself was a tribute to its founder’s vision of growing grapes to produce non-alcoholic wine (Vineland is where Welch’s Grape Juice got its start). Dr. ECB started his medical career close to where he grew up, as a general practitioner in Otis, Massachusetts. He was active in the abolitionist movement in Berkshire County. 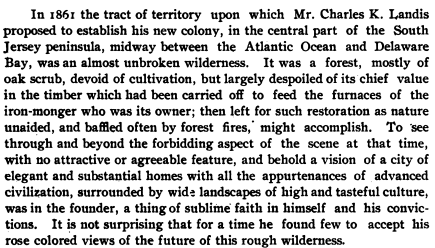 It is likely that Charles Landis’s Utopian ideas would have appealed to him. ECB was an early proponent of the germ theory of disease. My grandmother told me that his work on the Black Rot fungus was connected in some way to the discovery of penicillin. I don’t remember if she explained that to me, or was just mentioning it as a matter of family pride. I’ll put that on my already long list of topics to research when I get a chance. I expect to share more information on my great-great-grandfather as I come across it, both online and in my grandmother’s papers. It is fascinating (and almost surreal) to me to realize that I was close to someone who had, in turn, been close to someone who was born nearly two hundred years ago, and served in the Civil War. That’s a very personal connection with a large stretch of the history of this country. This post is my first follow-up to the preliminary announcement of my planned 90-minute lecture and discussion, to be given sometime in April or May of 2019. 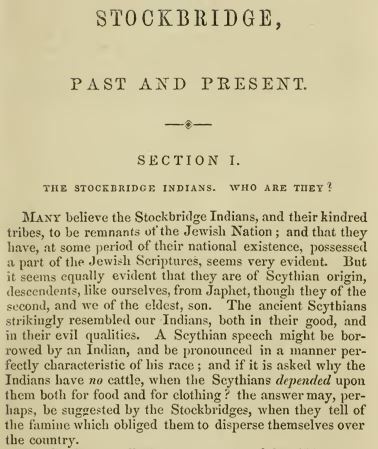 In subsequent posts I will share more background material on some of the illustrious characters in the history of Stockbridge, as well as more stories from my childhood. The Berkshire Hikers are a group that go out on the trail every Tuesday, year round, in all kinds of weather. On a recent Tuesday (August 28, 2018), I led the group, consisting of 18 intrepid souls, over a mountainous trail that included a stop at Laura’s Tower in Stockbridge. Despite the heat advisory that had been in effect that day, only two of the original 20 hikers signed up decided to cancel. As the MapMyHike map (from my phone) here shows, we began at the end of Park Street in Stockbridge. I lived in a small house on Park Street until I was about 9 years old, and I have many fond memories of that time, which I will recount at other times. Here is a small sample. That story is about the days before dial phones, and now I have a smart phone. I’m still uncomfortable with the phone part, but the smart is lots of fun. It allows me to see maps like this one, and to find my location in realtime. Based on many hikes, by comparing distances on maps and signs with the number reported on my phone, I know I have to add 10% to the MapMyHike distance to have an accurate reading. In this case, my phone said 3.74 miles, so adding the 10% gives about 4.1 miles. 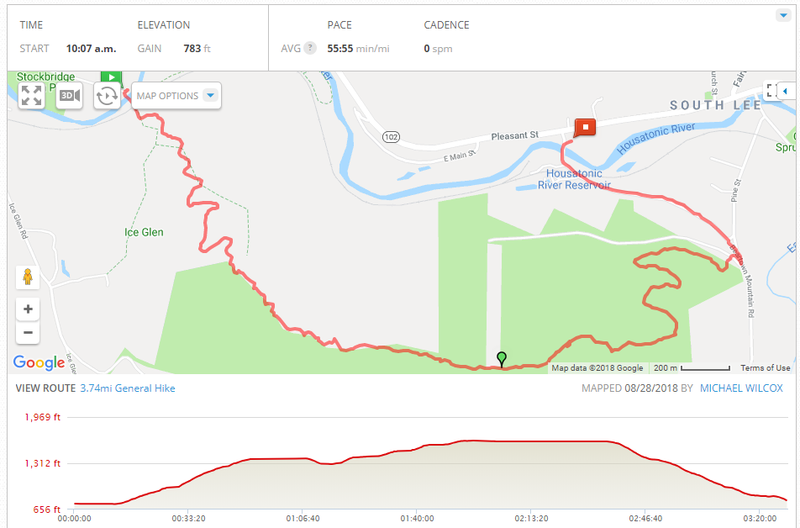 The altitude profile tends to be fairly accurate, and shows that we gained about 900 feet from the parking lot by the Housatonic River to the top of the ridge, where we had lunch. The long flat line at the highest elevation represents time sitting still at that highpoint. The hike took about half an hour longer than I had anticipated, but given the heat, that is not surprising. On the map, above the green pin, you can see a long white rectangle. I explained the origin of this to our group when we reached that point on the trail. The tale involved moving the Stockbridge/Lee boundary about 20 yards to the east, as a result of surveying work done around 1960, when route 102 was rerouted over the hill there, instead of following the curve of the River past what was then the Stockbridge Lumber Yard. 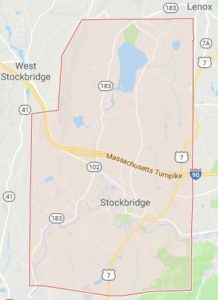 The house where I spent my teen-age years was on the north side of route 102 (East Main Street in Stockbridge) exactly north of that white rectangle. The large sign that is still there (“Entering Stockbridge” on the east side, and “Enter in gLee” on the other side) was not moved when it was discovered that the town line was actually on the west (not the east) side of our house. Instead, the Great and General Court passed a special piece of legislation that ceded that strip of land to Stockbridge, thus throwing all maps into confusion, although allowing my family to remain residents of Stockbridge, and keeping the boundary where it had traditionally been thought to be. My family moved to that house in South Lee (as we called it, although it was — we thought — not in South Lee, but in Stockbridge!) on Thanksgiving Day in 1956. My sister Sarah (youngest of the 5 of us) was only 2 at the time, and she had been the last one to come down with the mumps. She spent the whole day screaming in pain, poor thing. My Uncle Phil had helped us move, and he and my father went up on the hillside to round up some firewood, since the only heat source in the house was a pot-bellied stove. I later learned that the previous occupant had been a Miss Murphy. It was a very large house (suitable for a family with 5 children), and there was a separate living space that went unheated and unused (except in warm months, when it became play rooms for children, and a place for magic lantern shows for the neighborhood kids). In that “apartment” (as we called it), had once lived a local chemist, who worked at Hurlbut Paper Company. Dr. Jessie Minor was a PhD in the days when that was quite uncommon for women. My mother told me, as an example of her brilliance, that during the war, Dr. Minor worked on the Enigma project in England (I learned this long before I knew of Alan Turing), the code-breaking that helped defeat the Nazis. In writing this post, I was wondering if my memory of how to spell her name was accurate, so I did a web search, not really expecting to find much, if any, information about her, but I did come upon this snippet, which validated my recollection, and also my impression of her age at that time. Shortly after we moved to South Lee, I became friends with Dr. Minor, who told me many stories. In the summers, she recruited a bunch of local kids to help her make Christmas cards for the Indian reservations, as part of her work for my church’s Missionary Society. That is a story for another time, set in her apartment on the second floor near where the Mobil Station now is, at the head of Park Street. One of the tales she told me was of her time living in that house in South Lee, where I had moved to long after she left, when I was 10 years old. She moved in to the apartment there because it was within walking distance of her job at the Hurlbut mill. The house was owned and occupied by a widower, Mr. Murphy, who also worked at the mill, and his adult daughter. Every working day, Miss Murphy (as Dr. Minor referred to her), would make lunch for her father and bring it over to him at the mill at lunchtime. At some point, while Dr. Minor was living there, Mr. Murphy died. His daughter evidently never accepted that explanation for his absence, and every day the mill was open she would make his lunch and bring it for him. At first, the mill workers tried to explain to her, but eventually gave up, and just accepted her offering every lunchtime. By coincidence, that same white rectangle on the map outlines the central focus of what had been a ski area on that mountainside. It was originally built back in the dark days of the Depression, when the CCC provided jobs for men (no women were allowed) to work on public works projects. There are several maps and pictures on the link just given; a couple of them are reproduced here. This first map shows the approximate location of a rope tow that more or less followed that (by now infamous) white rectangle up the hillside. Many thanks to Ellen, one of our hikers, for finding that website. She also took the picture of the wheel shown in this post. That is the same website that I had used to find similar information about the operation at Jug End Resort, but I hadn’t thought to look there for Beartown. I think the place where our group had lunch is approximately where the word “Kodiak” appears on the maps. I had pre-hiked the route a couple of times, to be sure I knew where this trail went, since it is poorly marked in places. My friend Joe and I had gone most of the way a few months back, when there was still some snow on the ground, and we had spotted the wheel pictured here. A week or so before this hike, my friend Bess and I went the entire route, because I wanted to be sure I knew the descent all the way to the Hurlbut mill, since Joe and I had not finished the downhill section, having returned to Park Street the day we inspected the trail. 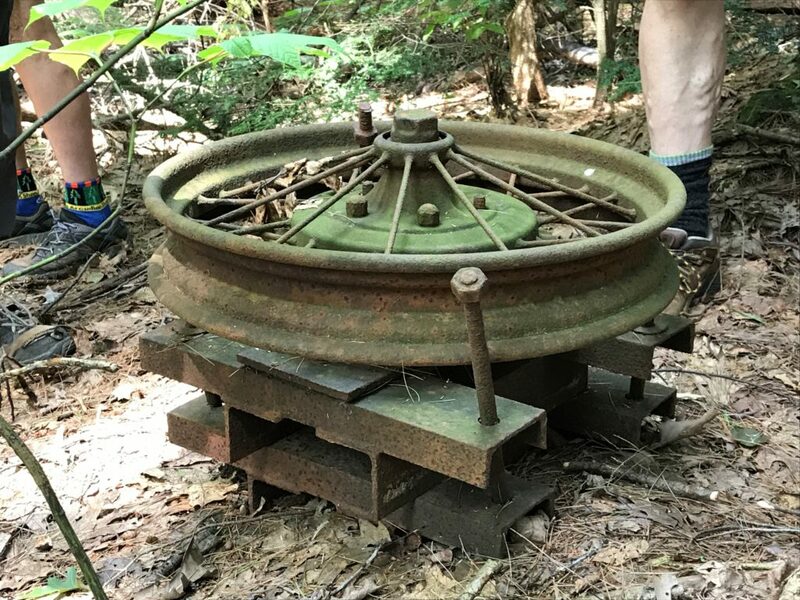 Bess and I did not see the wheel (probably because it was hidden in the undergrowth), although we did find a series of metal poles that must have been part of the rope tow apparatus. 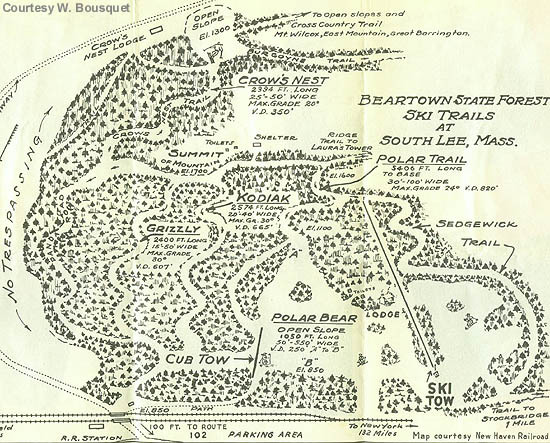 Notice the misspelling of “Sedgwick” in the ski area trail map. 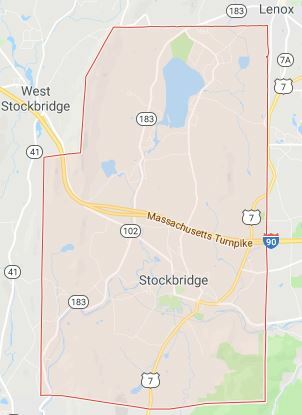 On this map of Stockbridge, taken from Google Maps (which, amusingly, is accompanied by a picture of Main Street in West Stockbridge), the town line is shown to go approximately in the middle of the white rectangle. Along the Housatonic in Lee, the state forest (green shading) goes down to the River, but in Stockbridge, the area next to the River is part of the Sedgwick Reservation of the Laurel Hill Association. The trail we hiked along the ridge above the River runs along the border between Beartown State Forest and the Sedgwick Reservation. From looking at the maps and the photos, I think we were probably using the area called the “Polar Bear” slope, so it’s possible those other features existed and we just didn’t get that far. Still, I don’t remember (and I lived there until 1963) any activity on the mountainside while we lived there. On the other hand, I had probably discovered girls and had things other than skiing on my mind. In the Spring of 2019, I will be teaching an OLLI course on local (Berkshire County) history. There will be six lectures covering six different locations, surveying the history and present use of the land, tracing as far back as possible before European contact, and continuing to the present day. 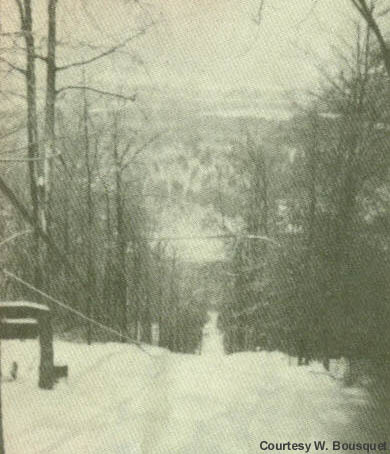 This post represents my initial research into one of these areas, the trails that now go to the Ice Glen and Laura’s Tower in Stockbridge, with some side-trips into the history of many of that town’s important citizens over the years. Although I grew up in Stockbridge, and my grandmother was a highly-respected local historian, I claim no special knowledge of the town and its history. What you will find here is mostly drawn from public sources, which I have cited whenever possible. Laura’s Tower … was built by Joseph Franz to replace a decrepit wood structure. … was part of the Sedgwick Reservation and was given to the Laurel Hill Association by Lydia C.R. Sedgwick in 1932 in memory of her husband, Alexander Sedgwick. The tower itself was given in memory of David Dudley Field’s daughter-in-law Laura Belden Field. The findagrave.com website has some further information on Dudley Field (David Dudley’s son) and Laura. Later posts will cover more information I have received from my brother and other sources, as well as a description of hiking the trails. UPDATE (August 29) now that I have led a hike up to the Tower and beyond (over to South Lee), I have much more material to add: Here it is! My mother had folk wisdom for every occasion. I’ll try to add to this list as I recall more of her sayings. Be careful you don’t get too big for your britches! My, aren’t you full of piss and vinegar! If is was a bear, it would o’ bit you! I’m hoping, as is my wont, to get off the road to hell. Nearly five years ago, I placed this genealogy chart on my website, with the intention of following up with more information and commentary. So the paving had begun some time ago. Recently, a friend in town reminded me that he had discovered that his lineage can be traced back (as can mine) to John Wilcox (sometimes spelled Willcocks), one of the Founders of Hartford. So, we are related, and it will be fun to see where the family trees diverge. I thought of this chart, which my mother prepared many years ago (obviously), under the guidance of her mother-in-law, who knew everything about how my father’s family was connected with everyone in the known universe. The chart is light on dates and other specifics, only hinting at many stories that need to be told. I have lots more information that was left to me by my grandmother, and getting it all digitized and organized have been some of the paving stones that have so far smoothed my road. Perhaps embarrassing myself with this post with provide a bit of motivation in changing direction. In the chart, the Wilcox name in Stockbridge goes back only to around 1800, and I know I have evidence of additional lineage from there back to Simsbury Connecticut (where there is a Wilcox Street in the center of town) in 1732, and eventually back to Hartford ca. 1635. I now live at the base of Tom Ball Mountain, and I have long wondered, but been unable to find out, what, if any, connection Tom Ball had to my Stockbridge ancestors, who included the Isaac Ball shown on the chart. Tom Ball was not European, and evidently “owned” (an English concept) the mountain and much land to the east of it, which is now Williamsville. So his Anglicized name was chosen for some reason, but I’ve not been able to discover it. A few years ago, my brother Rick was researching the Stockbridge town records, and came across a copy of the special bill passed by the Great and General Court in Boston, giving permission to Isaac Ball to purchase land from the Indians. It was signed by Governor John Hancock. As my patient readers will detect, there is a plethora of family stories aching to be dragged into the light of day. I can only hope, not promise, that I will continue in my diversionary program and bring some of them here to provide entertainment to those who enjoy learning about life in these parts in bygone days. Behind any account of the indigenous peoples in my part of the world lies a tragic tale of the end of a civilization that had flourished for thousands of years, and the near-extirpation of a population and its culture. My plan (at least hope) is to publish several future posts on specific topics, including my exploration of what was called by the English invaders “The Indian Trail” that connected the two great rivers over the mountainous region of what is now northern Massachusetts. My subject matter will include its current state, as well as the history of the original natives of the area where I live (including eastern New York as well as western Vermont, Massachusetts, and Connecticut). I mean this to be a working entry. In other words, I will change and add to this post as I have time and new information. Forgive the rambling nature of the writing; keep in mind that it is a work in progress. I hasten to add that I am not an historian, and I rely on casual research that I have done on the internet, as well as other reading I have done, and stories I have heard from my family members as well as from members of the Stockbridge-Munsee Community (descendants of the original inhabitants of this area). I expect I will make many errors, and I will attempt to correct them as I learn more. Also, in trying to keep this entry somewhat manageable, I have simplified many things, and have not always acknowledged that there are often multiple interpretations of names and events. Also, for convenience, I will sometimes use the current names for places or features (such as “the Hudson River”) even though they obviously had different names before the Europeans arrived. The original inspiration for this investigation came from some trips along a portion of Mahican-Mohawk Trail by the Berkshire Hikers. We hiked the section within BNRC’s Hoosac Range Reserve. This relatively easy hike along the ridge starts at the parking lot on route 2 in North Adams, just above the Hairpin Turn, and goes south for about 3 miles, with the return route being nearly identical, for a nice 6-mile hike. Along the way, there are spectacular views to both the east and the west. This trail passes over the historic Hoosac Tunnel, which has a storied history. It first opened for business in 1875, and is still in use today. Our leader, Bess, did some research on the origins of the tunnel, and its construction, and shared what she had learned when our group arrived at the place on the trail that is directly over the tunnel; not far from the infamous Central Shaft, in which many workers died. I offered to look into some of the earlier history of the area. In particular, I had always been puzzled by why the automobile route, now designated as route 2, had come to be known as The Mohawk Trail, when I knew that the Mohawks had not lived around here. I became interested in the Mohicans when I was very young. My grandmother Wilcox was a librarian in Stockbridge, where I grew up, and she had started The Historical Room in the library. I frequently went to her office after school; it was cool and quiet, in the basement of the library; far from the chaotic regimes of home and school. It was a sanctuary for me, where I could read and do my homework in peace. In a world that didn’t understand autism, it was one of the ways I created accommodations for myself (I can see now, in retrospect). As a bonus, my grandmother would sometimes tell me stories, and show me things in her collection. But I digress (not for the last time, I promise you). 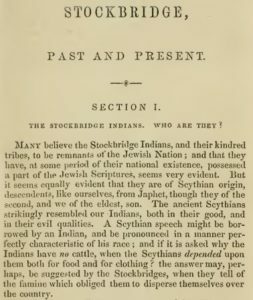 My grandmother had a close connection with the Stockbridge Indians, both as an historian and in real life. I just love the flowery language in these old books, and the words and phrases that are at once archaic and erudite. I will, for example, humbly attempt to perform the office of cicerone. 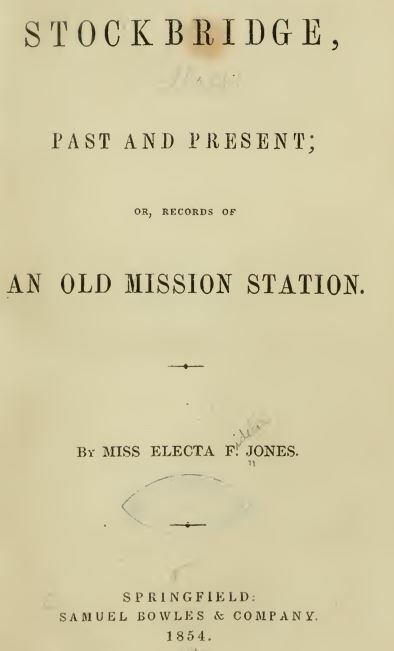 This oft-cited book, by Electa Jones, starts out with a bang, and reveals the startling advances in our knowledge that have occurred during the century-and-a-half since the book was published. I have not (yet) seen an attempt at a definitive timeline of when the Algonquins arrived in this area, but it almost certainly preceded the time of the Sycthian empire in central Asia (dating back to about 3,000 years before the present time). I’ve already used two different spellings of the short name, used by the English, of the native people: Mahican and Mohican. They are both pronounced Muh-HEE-can, although there are many variations that appear to be acceptable. I’ve shown here ^ the address of the newsletter of the tribe; they currently reside in Wisconsin. The name of the people is variously reported as seen here (Moh He Con Nuck), and as “Muh-he-ka-neew” or “Muhhekunneuw” and any number of other versions. The neuw/neew suffix seems to have been the singular form. Similarly, the precise translation of this phrase is elusive. The problem is twofold here. For one thing, like most (perhaps all) of the indigenous peoples of the Americas, the Mohicans did not have a written language; only an oral tradition to recall their history. The second factor is that the language died out as it was originally spoken. Currently, there are no living persons who grew up speaking the language. There are only a handful of native speakers of similar, related languages. The Dutch evidently had several spellings for what they heard, including Mahikander (sounds kinda Dutch), Maikan, and Mawhickon. The English version was Mahican/Mohican, and the French had their own name, not taken from the people: Loups (wolves). Other variations are given by Jones [p 14]. Fortunately, there exist dictionaries that were recorded by Europeans during the colonial era. The spellings and pronunciations of Mohican words that were adopted by the Europeans were heavily influenced by the native language of those who first encountered them. This area was at the confluence of English, French, and Dutch attempts to achieve hegemony. Muh-he-can-nook has been variously translated as “people of the continually flowing waters” or “people of the waters that are never still” or other variations. In the oral tradition of the people, the restless waters apparently referred to their place of origin in the west, perhaps the Pacific Ocean. Some have even speculated it might have referred to their passage across the Bering Strait, although that interpretation does not seem to currently have much support. The “flowing” of the waters seems to have originally meant the tides, as alluded to in Jones [p 15], so may have referred to their residence on the Pacific Ocean. In any case, the people identified with the rivers in this region, which represented to them a connection with their origins. They, along with related tribes, became collectively known to the Europeans at the River Indians. Their own name for the river we now call the Hudson was Mahecanittuck. “Mohican” and its variants refer to the moving waters, and the nuck suffix meant “people of” — the neuw/neew, as mentioned, seems to have been the singular form. The Mohicans in this area eventually became known to the Europeans as the Stockbridge Indians, and the Stockbridge-Munsee Band in Wisconsin are descendants of those native people (along with some other native groups that they teamed up with on their long forced removal to the west). There is an active effort in that community to reconstruct the original Mohican language. The challenges are obvious, but one piece of good news is that there are a few (3) elders of the Munsee tribe in Canada who are native speakers of that dialect, which is closely related. When the Europeans first arrived, there was an already-ancient trading route going over the mountains from the Connecticut River to the Hudson River. The English called this the Indian Trail, and, in order to facilitate their expansion into the western regions, they began to construct a road suitable for wheeled vehicles, beginning on the western side of the Connecticut River near their settlement in Deerfield. They more or less followed the Indian Trail, except where that footpath was too steep, or otherwise unsuitable for their wagons. This route eventually became the automobile road we now know as route 2. I have some maps of the trail networks at the time of first contact with the European intruders, as well as some references to the early road-building by the English settlers. How did the Mohawks get their name on the Trail? The territory controlled by the Mohicans extended from the lower tip of Lake Champlain all the way down the the upper reaches of Manhattan, and from the Schoharie River on the west to the Westfield River in the east. The Mohawks made a name for themselves (in this context) with a single event that occurred in 1664. Early Draft: to be revised upon completion of our hike tomorrow (May 29). As of the night before, we have about 15 people signed up for a 6-to-7-mile hike tomorrow, featuring 3 peaks in 3 different states, and a bonus visit to the high-point in Connecticut (not its highest peak, although that is nearby). We will start at the south end of East Street in Mount Washington, at the Massachusetts/Connecticut state line (bottom right center of the map below). The elevation at that point is about 1,900 feet. Our route takes us almost due west, weaving back and forth between the two states. The first stop is the peak of Round Mountain, which, at 2,296 feet, is the second-highest peak in Connecticut. Almost directly behind us, to the east, is Connecticut’s highest Peak, Bear Mountain, 2,320′, on the other side of East Street (which, south of the state line, is called Mount Washington Road). This first half-mile, with its 400-foot climb, is extremely difficult, at times going up some rather steep rock faces. The views from the top of Round Mountain, however, make the effort worthwhile. We can look back to Bear Mountain, almost due east, and can see many other peaks, such as Mount Everett, Mount Ashley, Mount Race, Brace Mountain, and others. On a clear day (which we expect tomorrow), Mount Greylock is visible in the far distance to the north. Our 360° view also takes in Riga Lake and South Pond. After taking in the sights, we will again move westward, this time dropping down along some more rock ledges. After a short descent, we will again head upward, and cross the state line, to the peak of Mount Frissell, which, at 2,454 feet, does not even make the list of the ten tallest Massachusetts mountains. There will be no need to pause here, because the summit of Frissell is completely surrounded by thick trees, offering no views. We will continue along the trail for another couple of hundred yards, which will take us into Connecticut. There, we will find a marker for the highest point in Connecticut, and enjoy some beautiful views to the south. Continuing west, we will soon come to the 3-state marker, at the point that the Mass/Connecticut border comes to and end and the Mass/New York border takes over. 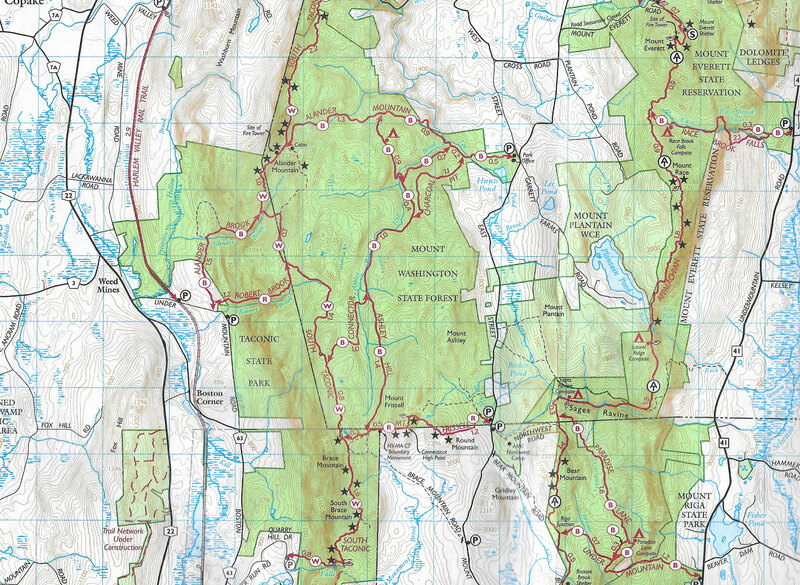 Another ¾-mile trek brings us to the western end of the Mount Frissell Trail, where it connects with the South Taconic Trail. At that intersection, we come out of the forest, to be greeted by spectacular views of the Catskills in the west, with lush farmland below. We are now at the farthest southwest corner of Massachusetts, although the state once continued to the west. We can look down on Boston Corner, which once defined that corner of the state. Stay tuned for the story of why that changed. We have now walked about 2 miles; the most difficult part of the hike. Our journey from here will have some slight elevation changes, but will be mostly along the ridgeline. We will take a short detour south to have lunch at the summit of Brace Mountain, a popular place for paragliders. Also a popular place for rattlesnakes to sun themselves, so we need to be watchful. After lunch, we will retrace our steps for a quarter of a mile, and plunge back into the forest. We will hike along the Ashley Hill Trail, going to the north until it intersects with the east-west Alander Mountain Trail. Once we reach that trail, we will turn right and go another half mile to the end of our hike at the Mount Washington State Forest headquarters. Round Mountain (not to be confused with nearby Round Ball Mountain, where we hiked a few weeks ago, or Rounds Mountain). Round Mountain, 2,296 feet (700 m), located on the border of southwest Massachusetts and northwest Connecticut, is a prominent peak of the Taconic Range. The peak and southern slopes of the mountain are within Connecticut; the northern slope lies within Massachusetts. The mountain is located within the towns of Mount Washington, Massachusetts and Salisbury, Connecticut; much of it has been conserved as part of Massachusetts’ Mount Washington State Forest and Connecticut’s Mount Riga Forest Preserve. The south side of Round Mountain drains into Riga Lake and South Pond, then into Wachocostinook Brook, Salmon Creek, the Housatonic River, and Long Island Sound. The north side drains into Sages Ravine, thence into Schenob Brook, the Housatonic River, and Long Island Sound. Round Mountain is bordered by Mount Frissell to the northwest, Mount Ashley to the north, and Bear Mountain to the east. Round Mountain is traversed by the Mount Frissell Trail which connects with the South Taconic Trail to the west and the Appalachian Trail to the east. Similarly, there is very little historical information about the other two peaks (Frissell and Brace). There are plenty of articles about hiking there, and the other activities, such as high-pointing and paragliding, but nothing I could find about how they got their names. In contrast, there are many well-written accounts of the prize fight that took place in Boston Corner (referred to as Boston Corners in some sources). One of these appeared in Sports Illustrated in 1973. Parts of this story (similar to other versions) may be apocryphal in the sense that the famous fight was symptomatic of the lawlessness of the area rather than the cause of New York’s annexation, which evidently had already been agreed (though not enacted) at the time of the fight. Autism Connections was honored to have Steve Silberman keynote our 28th Annual Autism Conference on April 27. Among many other services, Autism Connections houses the Department of Developmental Services (DDS) Autism Resource Center for the western four counties of Massachusetts. I was privileged to introduce Steve to the Conference. I prepared remarks for the 15 minutes I thought I would have, until the organizers pointed out to me that they needed to make a few housekeeping announcements, and I should count on half that amount of time. So I trimmed my comments, which undoubtedly made them better. Here are my remarks, approximately as I delivered them. A special welcome to those who are here for the first time. For those of you who don’t know me, my name is Michael Forbes Wilcox, and I am the President of the Board of Autism Connections. I am not the first openly autistic person to serve on our Board, and I certainly won’t be the last. We’d like to have more. A word on language. I’m well aware that some people prefer person-first language, and use the phrase “people with autism” or even the more neutral euphemism, “on the spectrum.” I prefer identity-first language. I am an autistic person. I will use that language here in my remarks because that is what I am comfortable with, but please know that our organization respects all labels that are chosen by the people who must wear them. Our overriding principle is that people get to choose their own labels. I first figured out that I’m autistic 13 years ago, when I was 59 years old. For those of you who are not autistic, allow me to do the math. [laughter] Yes, that means I am now 72 years young. As if to compensate for our slow neural development at an early age, we autistics seem to age more slowly as well. We remain active intellectually and physically longer than our unfortunate neurotypical counterparts [laughter]. Or, so I am told. This organization, like most autism organizations, was started for the purpose of providing assistance to autistic children and their caregivers. 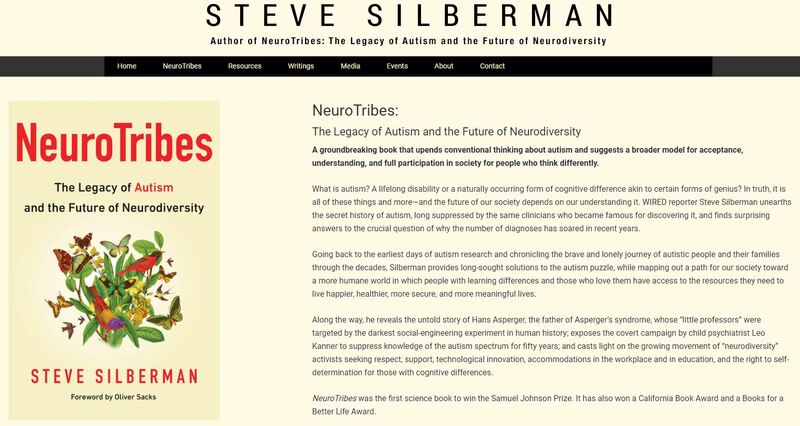 Our first speaker, Steve Silberman, will have much to say about this history, I suspect; or, at least, his book NeuroTribes does. In the early days of autism identification, not only was autism, in this country at least, thought to be a childhood condition, but it was believed to be almost always accompanied by intellectual impairment. We now know that these ideas give a much too restrictive view of the wide range of autism. The very word “spectrum” came into use, at least in part, to promote the idea that autism is not related to intellectual capacity, nor is it confined to any other subgroup of the population. Autism is a natural, and widespread, condition. Let me repeat that: autism is a natural part of the human condition. It is not a deficiency. It is not a disorder. It is a difference. It is a profound difference, to be sure. And one that many of us are very proud and privileged to own. Years ago, when I embraced my autism, I launched myself into an advocacy role. As you might imagine, one of my major interests was, and continues to be, the provision of adult services. I’ve served on many Boards and advisory committees. As Autism Connections expands our reach and implements new services, especially for transition age and autistic adults, we need your help. Whatever your skill set, believe me, we can use your assistance. If you are interested in helping with our activities as a volunteer, please contact me, or Karen Serra, our wonderful Director. Or, speak with any member of our staff, and they can pass along your interest to Karen or me. And now, let me turn from asking you for help to introducing you to a source of some wondrous information that will enhance your understanding of autism, and the needs of autistic people. I am referring, of course, to our first speaker, Steve Silberman. Music, for example, is very important to Steve. I can tell from his Facebook feed that he has been spending a lot of time lately with David Crosby. He calls himself a fly on the wall, but he’s being modest. He has produced albums and he is not an entirely passive player in the game. Two years ago, Steve gave the keynote address for World Autism Day at the United Nations. Ten years earlier, such an event might have been filled with the gnashing of teeth and the gushing of pity for us poor autistic folks who would never amount to anything. Instead, Steve gave an impassioned speech calling for the full inclusion of autistic people. I think that was one of the best talks you’ve ever given. I saw, in response, hundreds of people waving their hands in the air, and it brought tears to my eyes, to think how much the world has changed, even in the few short years I’ve been involved. So, in a few moments, when you welcome our speaker, instead of clapping, give it a try! You [again, looking at Steve] may remember the conversation we had at NYU when you appeared before the journalism school. You were asked how you came to be not just a reporter, but an advocate for autistic people. We talked about how, when you are black, or gay, or Jewish, or autistic, or belong to some other group that has been marginalized; discriminated against, misunderstood, picked on and bullied, excluded, and told in ways both direct and indirect that you are not welcome, you can easily develop empathy for someone else who belongs to a similar group. I asked you if you had observed, as I have in the hundreds of autistic people I have come to know; a high degree of social awareness and a very common desire for social justice. You just laughed and said, “I think it could be a diagnostic criterion!” Do you remember that? I’m not gay and I’m not Jewish, and Steve is not autistic. Yet, we have a lot in common. Here I am, trying to make a difference, and here you are, doing the same. 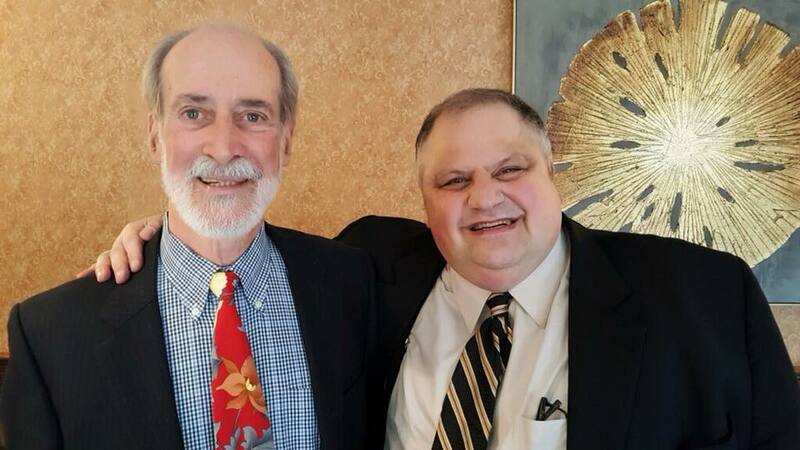 It is with enormous pleasure that I introduce to you my good friend, Steve Silberman. I’ve not been a regular blogger lately. That’s about to change (I hope). I have been doing lots of writing over the past few months, but haven’t shared it here. I’ve given lectures and talks for which I’ve prepared notes, and I have more in the works. Most of what I’ve just described relates to autism, and I’ve also been doing some extensive research and a bit of writing about various hiking venues (and their histories) here in the Berkshires. I’ll be sharing parts of that as well. And on the autism front, I’ve had extensive conversations (online and in person) about the latest revelations concerning Hans Asperger and his relationship to the Nazis who were in power during the time he was first writing and speaking about autism. I’ve not completed my research on this topic, but let me just say that I don’t agree with many of the interpretations that have been written. So there’s all that and more. You might want to stock up on popcorn. A recent article in the Washington Post has garnered some much-needed attention to a long-standing problem for the autistic community. A mother tells the story of a family outing in a park, which she thought had been going very well. It had been a good day at the park. A miracle day, in fact, for our family. Our 5-year-old son, who is moderately autistic and prone to violent outbursts and self-injurious behavior, had sailed through the outing without a meltdown. So it was all the more shocking when the police approached us. Someone had called the police, suspecting that the kid was perhaps being mistreated. Nothing could have been farther from the truth. The police were called on us because my son was having a bad hair day. What does this say about our society? We need less worry and more support. We need less judgment and more acceptance. We need less of what my friend Sara Zaske, the parenting writer, has called “the destructive police-calling culture” and more true help and awareness. I would even argue that while it’s fine and necessary to help autistics adapt to a world that they perceive as hostile, we should also be actively trying to make the world a less hostile and more forgiving place for people who act and look a little different, and for those who love and care for them. I also give her kudos for identifying her son as “autistic” — not as someone who “has autism” in the old “person-first” paradigm that is, thankfully, rapidly fading. The only demerits I would give to the article are really more commentary on society’s misunderstanding of autism, rather than on the parenting on display here, which strikes me as extraordinarily winsome. In the first quote above, the mother describes her son as being “moderately autistic” — I disagree with the idea that autism (or any disability) can be described as having degrees. Many of us who are autistic work very hard to avoid being identified as being odd, because our culture tends to treat differences and diversity very harshly. Some of us are more successful than others at overcoming autism’s challenges. To the outside world, this may look like different degrees of autism, but in fact, our performance is influenced by a myriad of factors that have nothing to do with autism. At one point in the article, the author says of her son that in addition to being autistic, “he also has sensory processing disorder” — an idea which doesn’t ring true to me. Having sensory issues is part and parcel of being autistic. Autism is not a disorder (it’s a difference), and its unusual sensory processing comes with the territory; it is not a thing of its own. Another “disorder” that is likely non-existent is the so-called “social communication disorder” which also strikes me as just being another manifestation of being autistic. In the vocabulary department, I note the common misusage of the word “nonverbal” to indicate “non-speaking.” Many, if not most, people who cannot speak do in fact understand words. These small complaints arise from my autistic need for perfection. I realize the world will never accommodate my desire, and I am sometimes even willing to admit to the possibility that I might be wrong about some things. All of this contributes to my inherent anxiety, another part of autism that I have integrated into my self-understanding. I have never met an autistic person who thinks that being autistic is easy. On balance, the struggles that come with autism are far outweighed by its advantages. Being autistic is a privilege and a joy.